It’s been four years since Genise and Jeremy Castaneda first turned up in Highland Park with their jackfruit tacos in tow. The couple, who was already selling their vegan sausages and seasonal tamales to a small market down the street, began operating a monthly pop-up called Plant Food for People at a defunct taco stand on York Boulevard. Their tacos, piled high with “carnitas” fashioned from shredded, marinated jackfruit (a green, spiky tropical fruit that grows everywhere from Mexico to Bangladesh and mimics meat like a champ) and dressed with all the traditional fixings were an instant hit, and support from Quarrygirl and other prominent vegan food blogs came quickly. “The first day we did it, I didn’t know what I was doing, but there was a line of people waiting, so I knew it was needed in the community,” says Genise, who grew up in the neighborhood and taught herself to cook vegan food with the help of a cookbook and Google searches. Jeremy agreed. “The tacos became the thing,” he says. 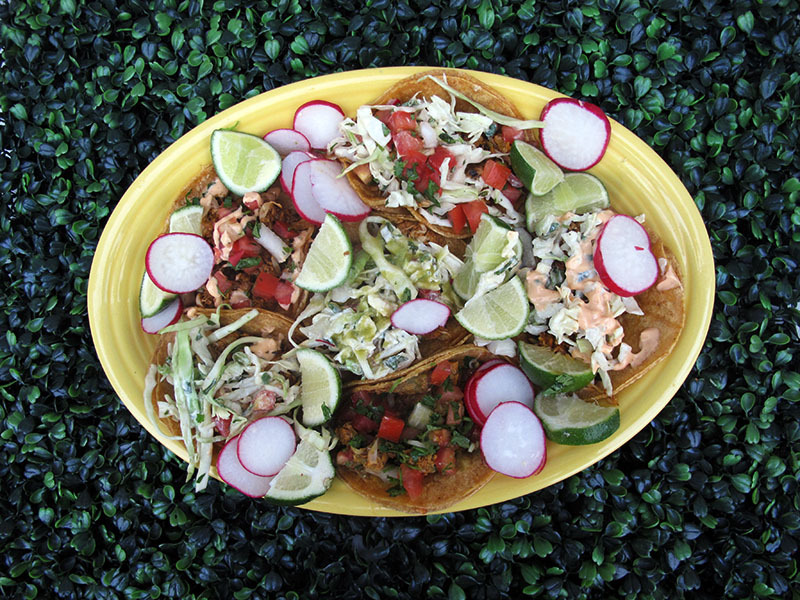 What followed after their debut was a slow but steady uptick of success for the Castanedas, who became a fixture at Highland Park’s Art Walk and eventually in the parking lot of Organix—a small organic market in Eagle Rock—where their weekly Taco Tuesday attracted regulars for a year and a half. It wasn’t long before Jeremy was able to quit his day job, and with the ultimate goal of opening the city’s first vegan drive-thru restaurant, the Castanedas have recently taken their business to the next level with a new food truck. “We were actually trying to avoid the food truck thing because we knew of a few vegan trucks when we started that didn’t seem to make it,” says Jeremy, who explains that rising rents in Highland Park, the slow-going nature of opening a restaurant in Los Angeles, and the promising growth of their business led them to reconsider a truck as a viable option back in March. So far, he says, the risk is paying off. Their new mobility, which has given them the ability to operate on a daily basis, is also helping them move beyond the vegan market and introduce their tacos to a wider (i.e. meat-eating) audience via farmers’ markets and food truck rallies. As Latino business owners, they’ve been especially excited by the interest they’ve sparked in the Latino community. Along with its expanding customer base, Plant Food for People has also grown its menu a bit, offering a torta with their signature carnitas, beans, cashew cheese, slaw, and chipotle mayo. The Boat—basically their taco minus the tortilla—is also available, and they’ve just acquired the equipment needed to produce large batches a potato-based nacho cheese that they’ve served to rave reviews in the past and plan to add to their menu soon. The big dream: making vegan food accessible to the entire country with a Plant Food for People location in every major city. You can find Plant Food for People‘s schedule updates on their Facebook page.